The first three Target Books, released in May 1973, were actually reprints of novelisations published in 1964, and so the style of the subsequent novelisations of the early 1970s came from books already a decade old. Doctor Who and the Daleks sets that style very well, although it’s much longer than the later norm (150 pages of small print against the usual 120 pages). Although clearly written for children, it has the same kind of feel as, say, Susan Cooper’s writing for Puffin: that is, it’s pretty dark in places. It begins with a car crash, there’s a dead body on the third page, the Doctor is initially presented as a malevolent alien (mellowing gradually as the book goes on), and the Thal death scenes are rather horrible. This is certainly more graphic than on TV: for instance, we only saw the claw of a Dalek mutant whereas here, Whitaker describes them as evil imps covered in slime with a single, alien eye. There are very few laughs (except unintentionally: Ian’s obsession with the TARDIS’s toilet facilities provoking one). In some ways it’s less subtle – Ian and Barbara’s budding relationship unfolds as a slightly embarrassing sub-plot – but mostly this condenses 170 minutes of TV action into a crisply effective and very readable book. It probably helps that it was written by the programme’s original script editor, who must have been used to reshaping other people’s scripts for time or effect. And there are some expedient changes from the broadcast version (Susan Foreman is re-christened Susan English to emphasise that she’s an alien posing as a British schoolgirl; Barbara’s relationship with Ganatus is excised because she’s now all a-flutter for Ian). The most significant is to give the Daleks a leader, a glass Dalek, which hints at Whitaker’s later creation of the Dalek Emperor and has no onscreen precedent (although it obviously did inspire the makers of Revelation of the Daleks 20 years on). Ian’s confrontation with this very specific Dalek adds a bit of weight to the book’s climax which makes it preferable to the relatively weak TV version. For the most part, though, it’s a faithful adaptation, with Whitaker taking the opportunity to make cosmetic tweaks and streamline some of the baggy midsections of Terry Nation’s scripts to the overall benefit of the story. 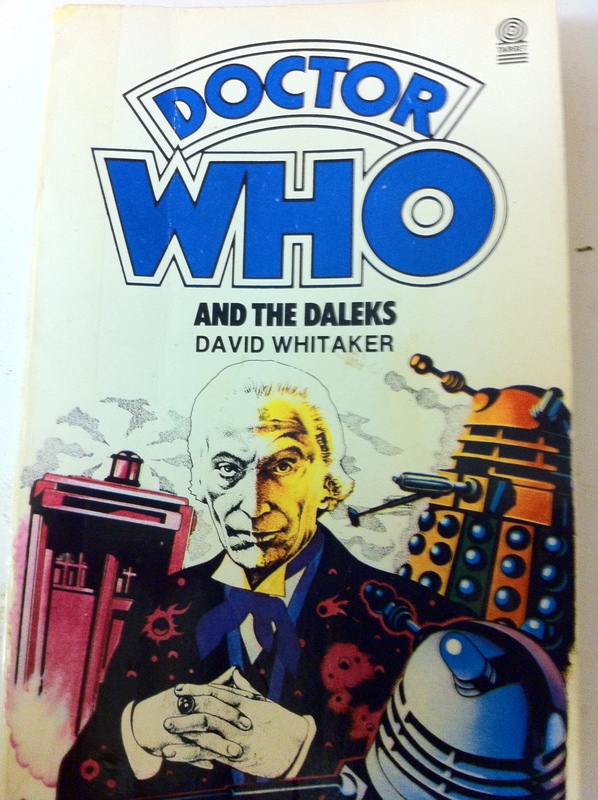 Interestingly, the 1964 edition of Doctor Who and the Daleks was titled “Doctor Who” – the reference to an exciting adventure with the Daleks was merely a tagline. That helps to make sense of the opening, which re-imagines the TV pilot episode into a brutal, terse and gripping encounter on Barnes Common. Therefore, this isn’t just a novelisation of The Daleks, it’s Doctor Who’s original script editor setting out the series’ premise (and in so doing making me wonder quite how much he input to Anthony Coburn’s scripts for An Unearthly Child). When I first read these novelisations, probably aged about 6 or 7, I gave them a mark. For the Pertwee novels onwards this was a normal 1-5 star rating. Oddly (and I was obviously an OCD fan even then), I rated the “black and white” stories differently, assigning a Grade from 1 (“excellent”) to 5 (“boring”). Doctor Who and the Daleks rated a Grade 3 (“good”). Given that my copy is very dog eared and held together with sellotape, I think I was being ungenerous. This is a great start. Clichés: Chapter 5 is entitled “Escape Into Danger” which is near enough to “Escape to Danger” to qualify. The creatures in the Lake of Mutations are as big as a house – the first of many monsters that will be much larger than onscreen.